I didn’t talk much about the exercise component of The High Fat Diet when it came out last year, but as part of the book, my co-author, personal trainer Zana Morris created a special high intensity home workout that blasts calories, builds muscle and revs metabolism. And, because it only takes about 10 minutes it’s also absolutely doable when you’re frantic. The only equipment you need is a resistance band as that helps you power up some of the moves. You can buy these in sports stores or online One2Fit Resistance band – Medium (Green) 2m If you have dumbbells, you can use these too. Here’s the plan….follow each move as directed. If you’re pretty fit, then do each move as fast as you can and don’t take a break between the moves. If you’re still working on building fitness then work at a steady pace and take a 20 second break between each move. Don’t be deceived, just because you’re at home, it doesn’t mean you won’t ache doing it. 1) Stand with feet hip distance apart, hands on hips or if you have dumbbells hold one in each hand and hang your arms down by your sides. Take a big step forward with your left leg. 2) Lower your right knee toward the floor aiming to just touch the surface. Right hip, shoulder and knee should all be on the same vertical line and your left knee should be just above your left ankle. 3) Push through your left heel to straighten your legs and return to the initial starting position. 4) Swap legs, taking a large step forward with the right leg. Then lower your left knee to the floor. 5) Repeat, alternating legs for 60 seconds. 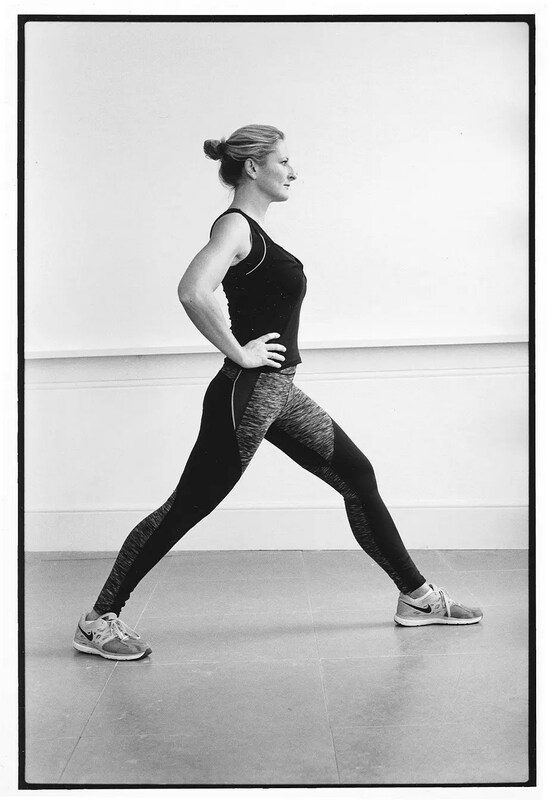 1) Stand with legs hip-width apart, toes facing slightly out. 1) Get down on your hands and knees. Start with hands just below your shoulders and knees just below your hips. Now walk your hands as far forward as you can while still maintaining your balance with knees on the floor Spread your hands slightly wider than your shoulders, fingers pointing forwards. 2) Bend your elbows to lower your chest almost to the ground. 1) Sit on the edge of a bench, sturdy chair, sofa or bed, feet flat on the ground. Walk your feet forward a few steps so your knees are over your ankles, then supporting yourself with your arms, lower your hips off the surface. 2) Inhaling, dip your hips as low as you comfortably can bending your arms at the elbows; if you start to feel strain in your shoulders that’s too low for you to go, so raise up a little. 3) Straighten your arms and as you exhale push yourself quickly back up. Repeat for 30 seconds. 1) Stand with feet shoulder width apart, knees slightly bent and arms by your side holding a dumbbell in each hand. Or, if you have a resistance band, hold it in one hand and stand on the other end with the foot on that same side. Your hands should be raised slightly towards you. 2) Now bend your elbows and bring the weights, or stretch the band, upwards toward your shoulder. Focus on controlling the move with your bicep muscles. Do not swing back and forth. If have to swing the weight is too heavy for you. 3) Lower slowly. Repeat for 30 seconds then swap arms and work the other side. 1) Sit on the floor, facing the wall, legs outstretched, knees slightly bent. 2) Hold a resistance band in each hand and loop the other end around the soles of your feet. Place your feet against the wall. Your elbows should be out in front of you slightly bent, palms facing each other. Body should be leaning forward, chin up. 3) Pull the band backwards moving your body into an upright position, chest, up, shoulders down and squeezing your shoulder blades together. Bring your hands in as close to your lower rib cage as possible. 4) Return to the start and repeat for 30 seconds. 1) Get down on your hands and knees. Walk your hands as far forward as you can while still maintaining your balance with knees on the floor, weight supported on your hands. Place your hands slightly less than shoulder-width apart and position your hands under your breasts/chest placed so your thumb and forefingers meet in a triangle. 3) Now push yourself up quickly straightening your arms to take you back to the start. You should feel this move in your triceps. Repeat for 30 seconds. 1) Stand on a step or the bottom stair. If you’re in a flat, find a large sturdy book or bench to stand on. 2) Using the banister or a wall for balance, start with your toes pointing forwards and raise your heels off the floor coming as high up onto your big toe as possible, contract your calves. Then lower heels as low to the floor as possible to a full stretch. Repeat as many times as possible for 20 seconds. 4) Finally, turn your toes outwards and repeat the move for 20 seconds. 1) Lie on your back, knees bent, feet on the floor and hands behind your head supporting your neck. Make sure your chin is away from your chest and look up towards the ceiling throughout. 2) Tighten your tummy muscles and slowly curl your chest and back off the floor, raising your chest up toward the ceiling as high as you can. 1) Lie on your back, and extend your legs up toward the ceiling. Keep your knees slightly bent and angle your feet so the soles of your shoes are flat toward the ceiling. 2) Contracting your tummy muscles use them to lift your hips off the floor and push your legs up toward the ceiling, as if you were trying to press your soles against it. You should feel this in the muscles under your navel. 3) Lower slowly and with control and repeat 20 times. Images: Copyright The High Fat Diet. Good luck with the bread thing. Actually I can go without normal bread no worries; its a stray baguette the lures me back.